With all the "innovation" that the Wii controls brought to this game removed, we are left with a bland somewhat lifeless game. I remember back in 2006 when the Wii console first launched one of the launch titles was a new Zelda game. People were ecstatic with the new gimmick controls the game would offer. You could swing Link’s sword using the wiimote and raise your shield using the nunchuck. You could even emulate drawing a bow with the combination of the wiimote and nunchuck. Even tho the controls were a bit clumsy, there was a certain level of coolness to swinging that wiimote around. And it’s because of the freshness those motion controls brought that people didn’t pay so much attention to the actual game, but more to what was new about it. Apart from the best graphical interpretation of the Zelda universe in terms of making it more mature and less childish, the game itself was a mediocre Zelda game. Today with The Legend of Zelda: Twilight Princess HD all the gimmicky controls got removed and we are left with the “important” stuff, the game itself. I will try to be honest here, as a major Ocarina of Time fan, i really didn’t dig Twilight Princess back then and i certainly didn’t dig The Legend of Zelda: Twilight Princess HD now. With all the “innovation” that the Wii controls brought to this game removed, we are left with a bland somewhat lifeless game. Yes it is a Zelda game, and yes it is a very good game in general, but if i were to rate the game compared to other Zelda games this would be among the lowest entries in the series. The Legend of Zelda: Twilight Princess HD does an honest effort to buff up the graphics to today’s standards, and they did an excellent job especially with character textures. Music is the game’s strongest point for me, there is some excellent music here that fits very well with the darker mood of the game. The old Wii interface got scraped. In its place there’s a new one that makes use of the Wii U controller displaying maps and information on the small screen. Some dungeons in The Legend of Zelda: Twilight Princess HD are among the best in any Zelda game, a fact contributing to that is the unique arsenal of weapons Link has. The new added bonus dungeon in The Legend of Zelda: Twilight Princess HD is a repetitive grind that you will maybe do just once. The best new addition is the Hero mode. If you are a Zelda veteran, i suggest you go straight for that. It will make the game much more interesting and less boring. 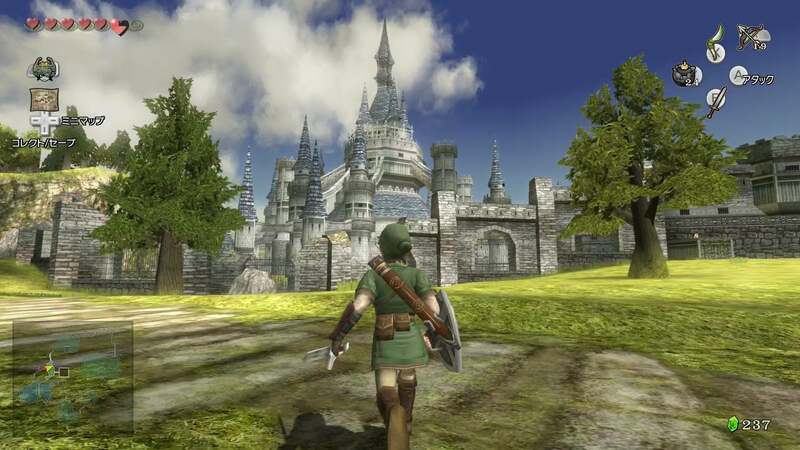 Gameplay wise apart from a few very minor changes and additions The Legend of Zelda: Twilight Princess HD is pretty much the same as the old version. One of the key gameplay elements is the ability of Link to transform into a wolf and visit a parallel realm. For some reason all this got underused and feels like a secondary thing in the game. I believe they could use much more of wolf Link in more complex ways. What made The Legend of Zelda: Twilight Princess a good game back then were the controls. The Legend of Zelda: Twilight Princess HD has all of that removed, it feels more like a downgrade and not an upgrade. Despite that, the game looks better and is still worth playing. In the very least it will keep you occupied till the real Wii U Zelda game comes out. Thumbs up for the updated Graphics and Interface. Thumbs down for not including the original motion control scheme as a option.